Back in the golden era of Argentine boxing, during the 1950s, Rudecindo Chaves never really stood a chance against the top contenders of his time. But later in life, he would get to see his son Ismael fulfill his dream and make it all the way to a world title bout in Australia. And even though Ismael was stopped in three rounds in that dream bout against Kostya Tszyu in 1997, he would later become the trainer of one of his young nephews, and in turn end up taking to a world title belt that was three generations in the making. Second chances are few and far in between for most people. But they run in the Chaves family DNA. For Diego Chaves (23-1, 19 KO) – who meets Brandon Rios (31-2-1, 23 KO) in a 10-round bout this coming Saturday in Las Vegas on Boxing After Dark – that chance has come in a different sport than the one he had initially chosen. "I played soccer in the minor league system of the Velez Sarsfield club until I was 18 years old," said former interim welterweight titlist. "Soccer helped me with my legwork, it gives me a lot of mobility. But I take boxing with much more respect and seriousness." In a country in which every kid gives at least one serious try to become a professional soccer player, having made it that far in one of the country's most consistent teams is quite an achievement. But the young Diego abandoned his promising soccer career to pursue that elusive title belt that was still sitting at the top of the family's wish list. And he got it with a demolition of Ismael El Massoudi back in July of 2012. That fight netted him the chance to face fellow undefeated welterweight contender Keith Thurman in his second trip away from his homeland (the first one being an irrelevant six-rounder in Las Vegas in 2010). The memories of that fight – and tenth round KO loss –still hurt. "The loss against Thurman was something we didn't deserve because we were doing great until the last round,and then we got careless," said Chaves, who is still eyeing a rematch. "We wanted to change the game plan at the last minute to lure Thurman to come forward a little bit, because he wasn't opening up the way he had in other fights. We changed our style and yet he continued going backwards, which was not good for us. And when we tried to go back to our previous fight plan I took that hook to the liver and I couldn't recover." 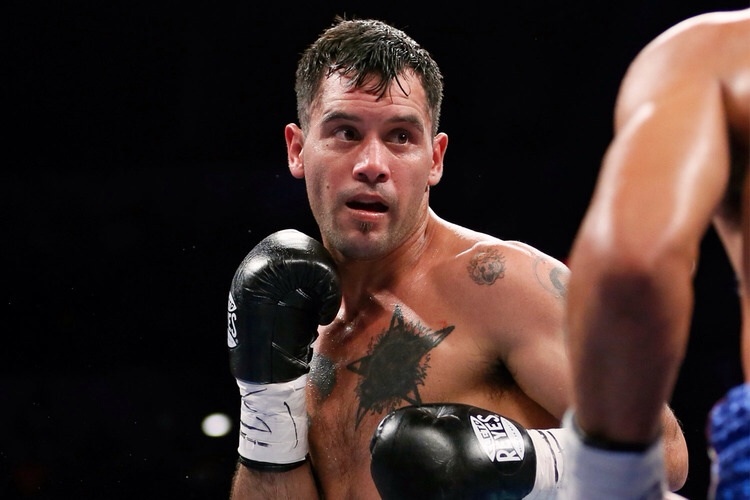 A win against Thurman would have put Chaves among the ranks of the "Argentine legion" of rising stars such as Marcos Maidana, Lucas Mathysse, Carlos Abregú. Instead, Chaves headed back home to regroup and rethink his career. He took only one minor club fight just to stay busy in early 2014, and then he got the call. "I really loved to hear that HBO thought of me for this fight, to hear that they wanted Diego Chaves for this big fight," he said. "Fighting in Las Vegas against Brandon Rios on HBO is something really big for me, and very special. After this victory, I am sure a lot more doors will open up for me." That opportunity almost disappeared for Chaves. A "glitch" in the U.S. State Department's database kept him in Argentina until Wednesday of fight week. When the visa was finally issued, he immediately flew to Las Vegas. Chaves will have to quickly put his travel woes behind him. Against Rios, he will be fighting a talented, highly-rated former champion trying to overcome a 0-2 streak in the last two years in a crossroads fight. Chaves is aware that this opportunity means much more than just a chance to break the 1-1 tie in his record fighting in the United States. "This is a new door that opens up for me," said Chaves. "I think the image I left (in the Thurman fight)was quite good. I think we have to change a little bit and become a bit more aggressive." It is easy to see why Chaves sees a more favorable scenario in this new opportunity. Thurman was a more polished, mid-long range fighter with great mobility, much in the mold of the guys Chaves ran into during his aborted path towards the 2008 Olympics (including names such as Demetrius Andrade, Erislandy Lara and others). His defeats against those fighters convinced Chaves to make the jump to the pros before even trying to qualify for the Olympics, in the understanding that his style was more suited for the paid ranks. And in Rios he will have a consummate professional brawler, one who will stand right in front of him and trade leather all night if he has to, bringing his own brand of aggression as well. "He has the heart of a warrior, like a good Mexican fighter. We know he has heavy hands, but he is much slower than Thurman. And we know that I am faster and I am much more mobile", says Chaves, who believes Rios will be the perfect opponent to showcase the more aggressive style he plans to bring out. "I know he's had great opponents like Mike Alvarado or Manny Pacquiao, but I am better than him." The big paydays and huge knockouts achieved by his countrymen in the 147-pound neighborhood are indeed an inspiration, but his goal remains the same: avenging his lone loss to date and then regaining his title. "I want the rematch, and then I want to be a champion again," says Chaves. "I don't care who I fight against. But first of all, I want to get that rematch done, and after that I can fight against anybody." If he manages to beat Rios he'll surely have his wish fulfilled, and his family's long history of resilience and persistence will prevail once again.